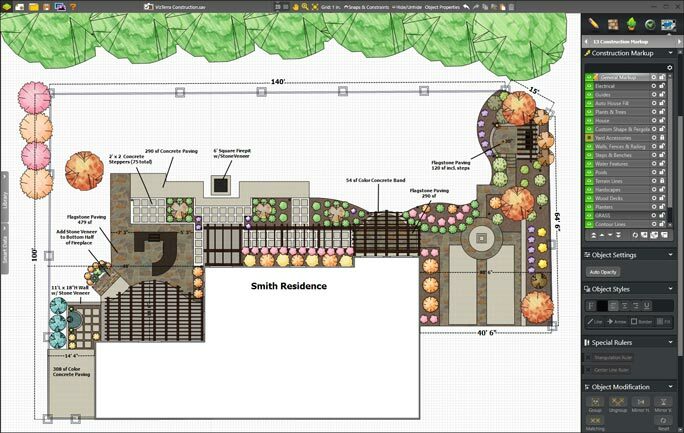 The most advanced landscape design software, for the most incredible landscape designs. VizTerra offers a streamlined interface, intuitive tools, and an extensive 3D library that makes it seamless to draw in 2D, transform your ideas into 3D, and then create a fully interactive 3D presentation to share with your clients — instantly. 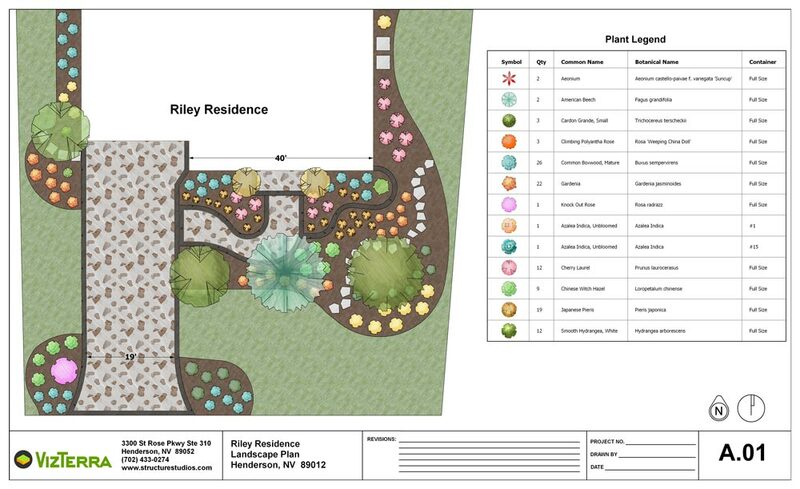 Build gorgeous custom projects that inspire your clients — with the landscape design software that makes fine-tuning even the most complex projects a pleasure. 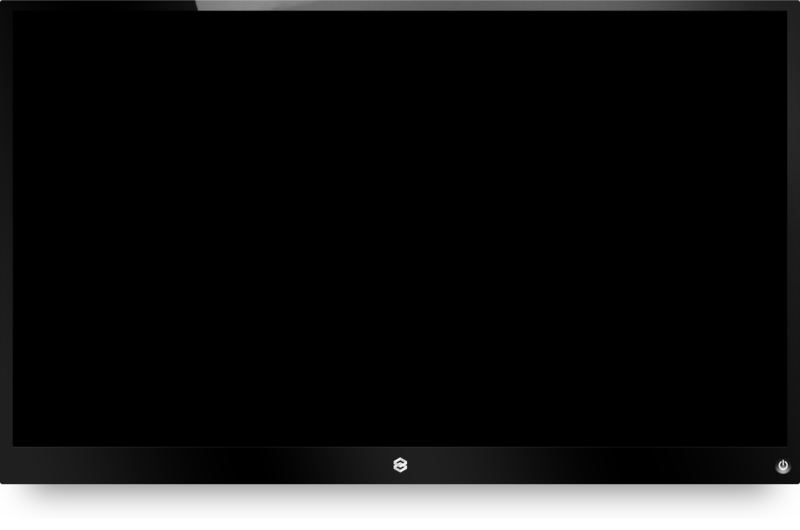 This is 3D landscape and hardscape design software for everyone. Share your ideas, inspire your clients, and create absolutely breathtaking outdoor living spaces. Beautiful videos, stunning images, and immersive sound — take advantage of the streamlined, innovative tools that give you the power to present your design vision like never before. VizTerra’s streamlined workflow — complete with smart design stages, flexible tools, and plentiful options — makes it easy to design anything in just a few easy clicks. Go beyond what your client imagined possible — and create the extraordinary outdoor living space of their dreams. 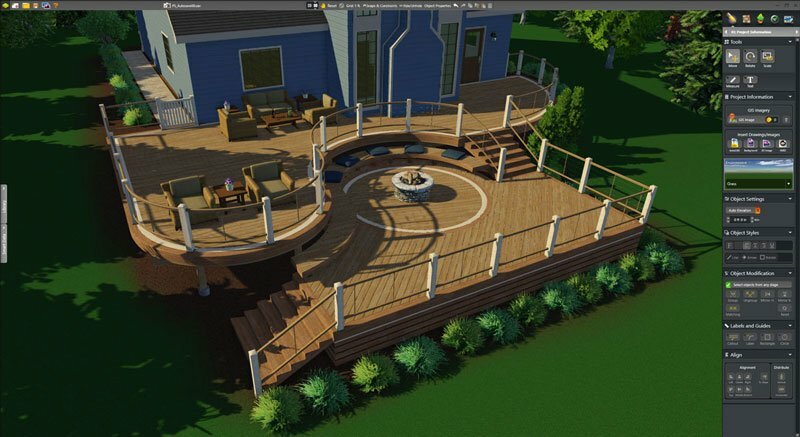 With integrated deck design software and professional video creation tools, VizTerra gives you the power to create extraordinary landscapes and outdoor living spaces with ease. 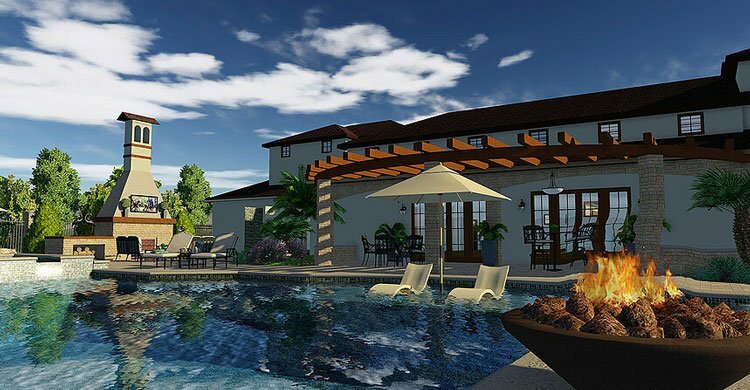 Delight your clients — take advantage of the most powerful and most precise landscape design software tools to deliver incredibly beautiful, remarkably detailed, fully customized results. Everything you need to complete your design is ready for you in the 3D library — just drag and drop items directly into your design. With the built-in content browser, you can search the library, explore new categories, and save your favorite furniture, accessories, plants, trees, materials, and more for easy access. Plus, with landscape design software’s powerful new tools that speed up your design process, previewing and saving templates helps you get more done in less time. 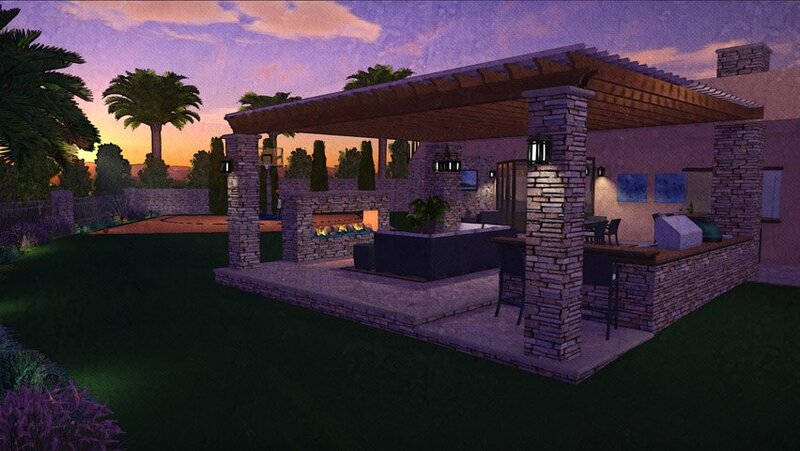 Treat your clients to a groundbreaking experience: lead them on a path through their future outdoor living space, fly them over their completed redesign, and explore together the personalized features and remarkable details that make your design exactly right. Interactive landscaping design software tools give you the power to add lush nature sounds, transition the scene from day to night, and help your clients imagine themselves already enjoying their new space. Harness the power of the most effortlessly customizable landscape design software — and let your clients see their new outdoor living space come together, beautifully. Go beyond the traditional screenshot when you harness the power of landscape design software to capture the most vividly stunning views of your design. With VizTerra's unique, powerful landscaping software tools, you can choose the perfect camera points, highlight custom features — and put the spotlight just where you want it. Trailblazing artistic effects, resolution up to 8K, and uncomplicated sharing options mean your work is ready for your clients to explore in extraordinary detail. Any angle, any view, any time of day or night — instantly ready to share with your clients via email and social media. VizTerra’s video storyboard transforms the video creation process: in just one easy step, you can create polished, professional videos with your landscape software, immediately ready to share with your clients on Vimeo and YouTube. 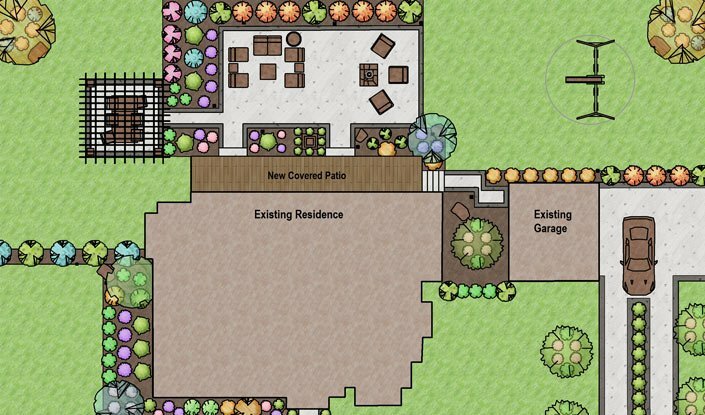 It’s never been easier to use professional landscape design software to highlight details, accentuate features, sync sound — and draw your client’s eye to the custom elements that make your design perfect for them. 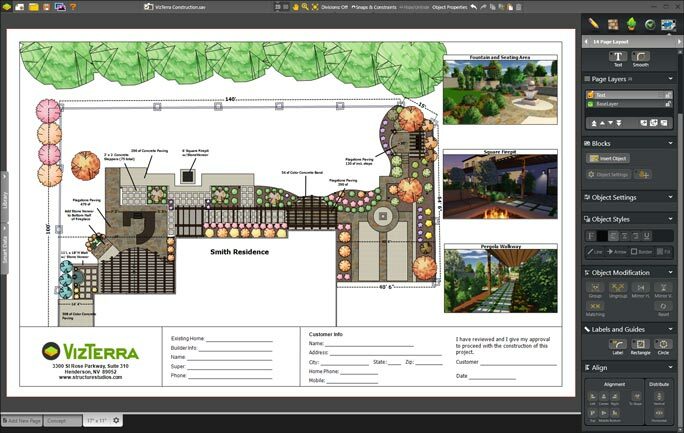 With an intuitive interface and powerful tools, VizTerra integrates advanced video creation tools directly with landscape design software, making it effortless to showcase projects of any size, from the most streamlined to the most complex. Eliminate any guesswork: offer your team construction plans that are easy to read in the field. 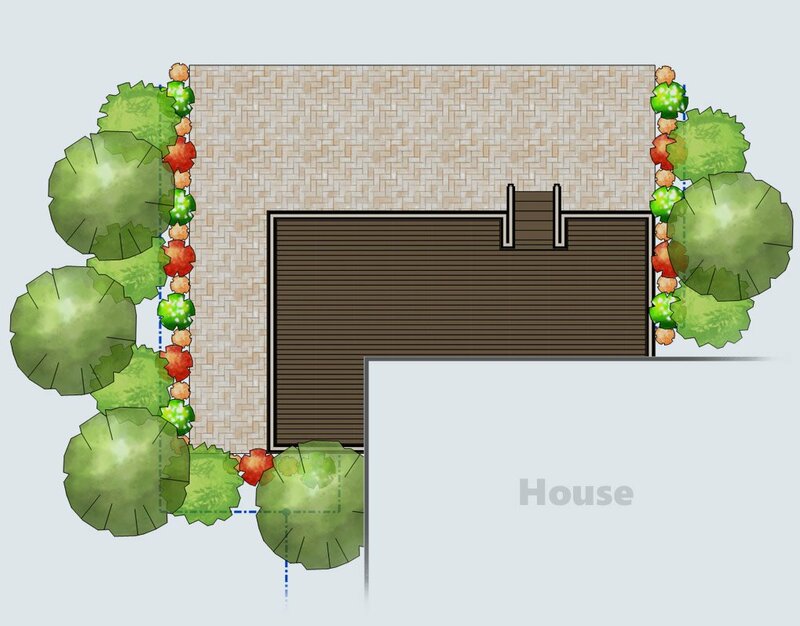 The fully customizable construction layer in the landscaping design software makes it easy to add the same level of precision and detail to your construction plans as the rest of your design. Choose your own line style and fill patterns with the landscape software that also gives you the ability to add 3D views to clarify and highlight important details. Mark plumbing, electrical, and gas lines. 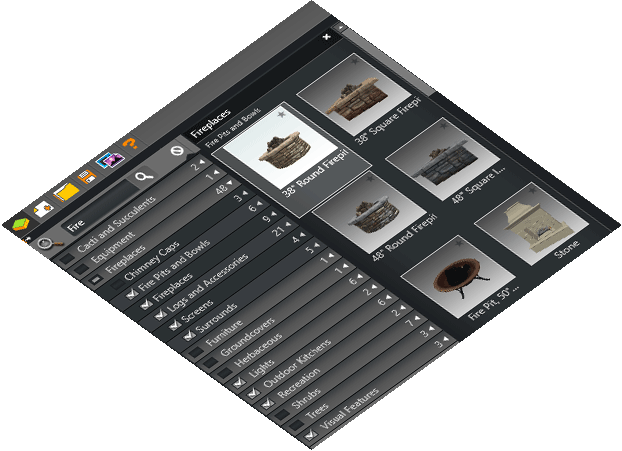 And customize your own unique symbols directly on your design, creating a construction plan with as much, or as little, information as you and your crew need. Fast, easy, and automatic: with one simple click, get the measurements and calculations that you need to build and price your design. 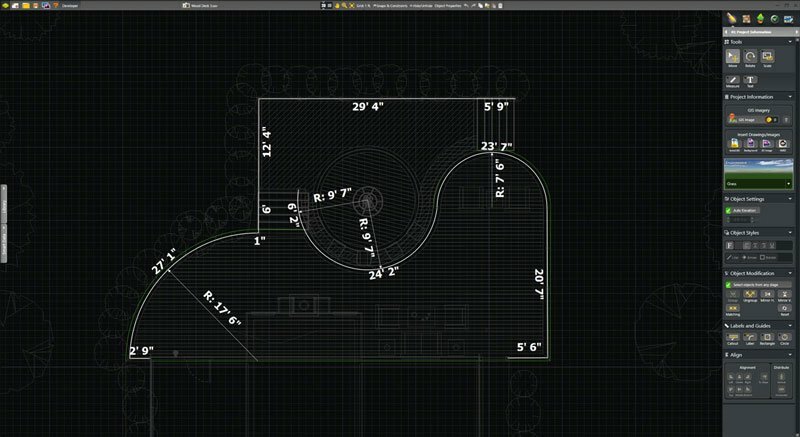 Whether estimating casual sketches or measuring precise plans, VizTerra effortlessly calculates the details: area, perimeter, square footage. 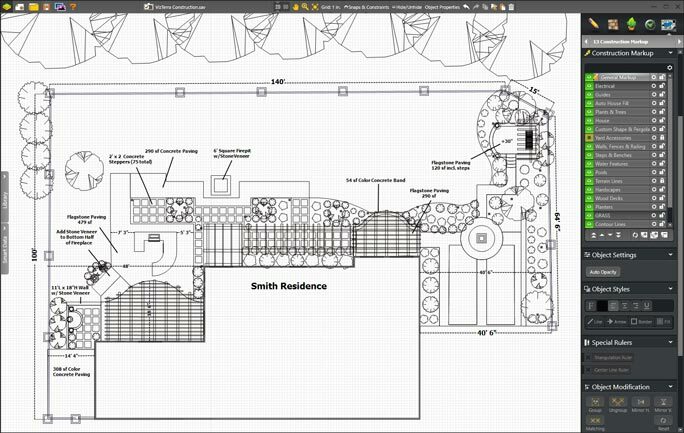 Any object, any design: landscape software makes it easy. The 3D landscape design software measure tool even makes it easy to triangulate key points, instantly. Simply click to select, see the results, and drop the calculations into your build-ready construction plans. "VizTerra is a new ‘silver bullet’ that makes me a fierce competitor in a very competitive market." 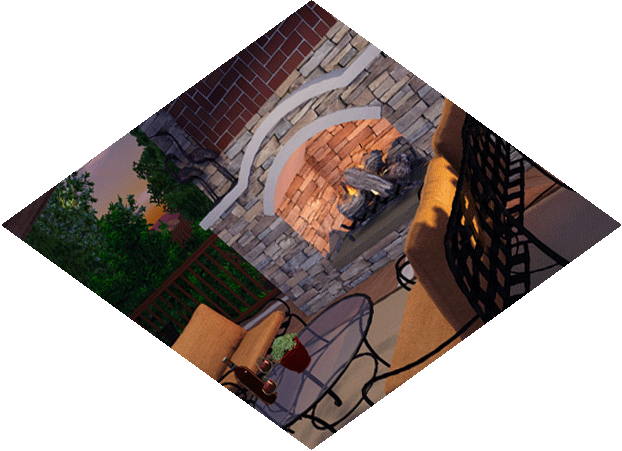 Make ordinary construction plans extraordinary with VizTerra’s unique 3D landscape design software color options. 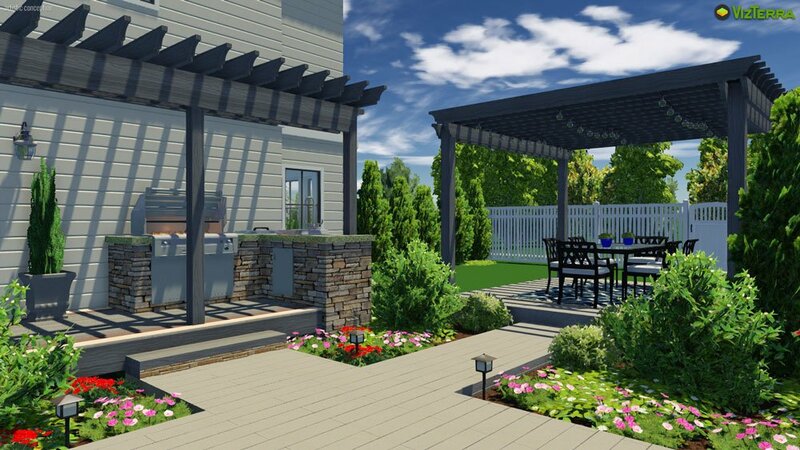 Enhanced color options, easy to apply in just one click, add exceptional brilliance and stunning realism to design presentations and construction plans created with 3D landscape design software. 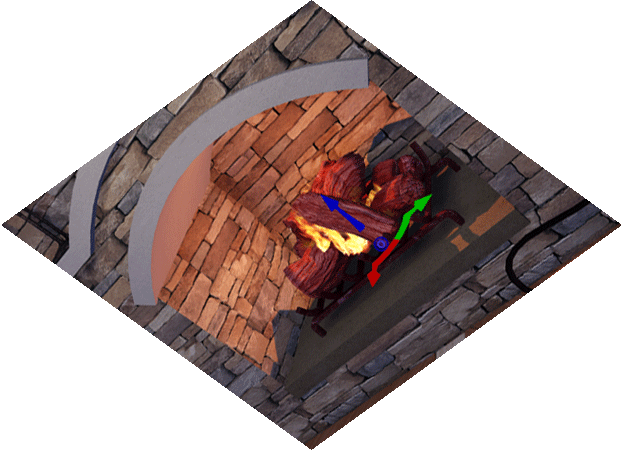 Experiment with detailed construction plan choices, apply accurate color to construction designs, and customize construction symbols. Improve on old-fashioned coloring techniques — even choose between artistic hand drawings — to reveal the beauty of your work. What's next? Learn more about VizTerra's design features.